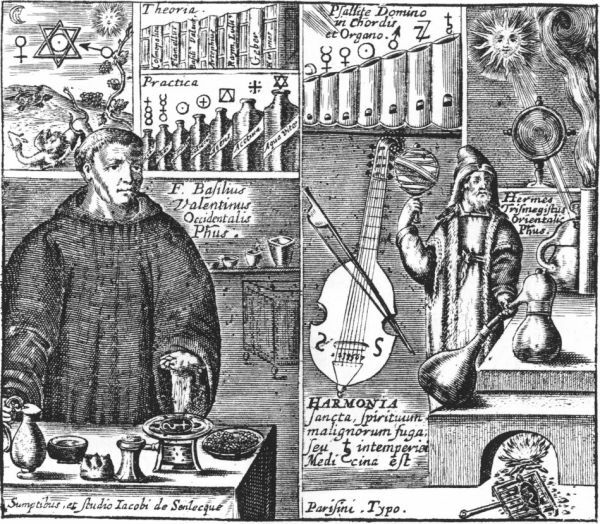 This is an engraving from the Revelation des mysteres des tinctures essentiales des sept metaux (Revelation of the mysteries of the essential tinctures of the seven metals) by the supposed Basil Valentine, published at Paris in 1668. It is divided horizontally into two sections, comparing the work of Basil Valentine to that of Hermes Trismegistus. On the right we see Hermes Trismegistus, described as the "philosopher of the East". He holds an astrolabe in his right hand while he adjusts with his left a distillation apparatus set on top of a furnace. Behind him we see an alembic being heated by the rays of the sun focused through a lens. The Emerald table of Hermes states "Its father is the Sun". A fire is set in the furnace and beside the fire hole is a gridiron on which is a tortoise bearing the symbol of Saturn. To the left of Hermes we note a viola da gamba, and above that a set of organ pipes which are tuned to the seven planets, the highest note (the shortest pipe) being the Moon and Saturn the lowest with the longest pipe. The text above the pipes states "Sing praise to the Lord with strings and the organ". Beneath the viola da gamba is the text "sacred harmony drives away evil spirits; or Saturn is the medicine for intemperance". On the left Father Basil Valentine is described as the "Philosopher of the West". He stands at a table on which are various vessels. Among these is a small portable heating apparatus, on top of which is a round disc labelled with the symbol of Saturn. Basil is the act of squeezing liquid from some material, possibly plant stems or flowers, or perhaps dropping tincture or grains of material from a phial, it is not entirely clear from the engraving. We see the drops falling on the heated lead plate. On the left, above his head, is an alchemical emblem. It shows a Sun and Moon, and the symbols for Venus and Mars set around two interlaced triangles which enclose a sun disc. In the foreground a lion attacks and is about to devour a dragon. 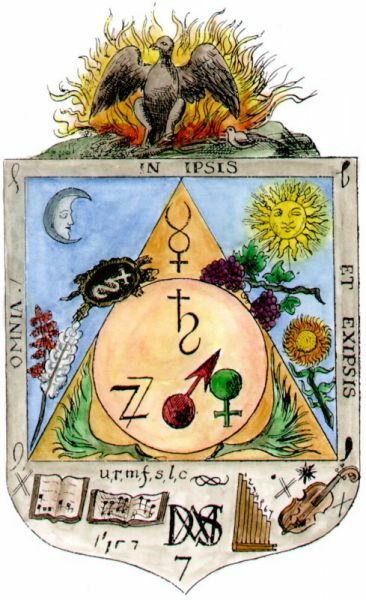 On the hill above this we see a tortoise bearing the symbol of Saturn, while on the right a vine bearing grapes grows upwards. The tortoise is a rare animal in alchemical emblems. On the right above Basil's head are the 'Theoria', books containing accounts of alchemy, from the authors Hermes, Geber, Raymond Lully, Artephius, Basil Valentine, Flamel, and the Cosmopolite. The 'Practica' below has bottles containing alchemical substances, Aqua Vitae, Acetum, Agens, Patiens, Ferment, with the labels of the last two difficult to read. Above the bottles are their alchemical symbols. These are presented, as with the organ pipes, in a series of descending sizes. The image at the top right relates to a very similar one which was published some 20 years earlier in Jean Brouaut, Traite de l'eau de vie, 1646. The Brouaut image also incorporates the organ pipes and the viola da gamba.